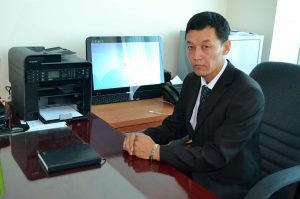 At university «the Center of information technology» for the purpose of expansion of using modern computer and information technologies in all scientific and educational departments have been organised. Making and support of information and computer infrastructures at university. Inculcation of information technology in educational process, creation of electronic libraries and management of educational process on the basis of information departments. Creation of possibilities of using by the professorial teaching staff, competitors and students the Internet and scientific national networks. to Support interrelation and to conduct joint work with foreign and republican educational institutions on problems of remote training, on new information technologies. Making programs and manuals on information technologies and remote training. Carrying out of seminars, conferences and meetings concerning information technology and remote training. Organize management on local networks of university. Management and development of testing at university together with IRC. Use of new pedagogical technologies in an education system. For realisation of remote training bases of computer system are created. Here are used 599 Pentium IV and modern computers, 516 connectors of computers and the local network with a speed 100 mb/с works.